More research is required to better understand the underlying genetics and biochemical pathways for red pigment (i.e. anthocyanin) development in the skin of full red (FR) and blush (B) pear cultivars. Until this knowledge builds, there are limited options in the orchard that can be recommended for growers to manipulate blush levels. Blush development is restricted when fruit are not exposed to light. In the orchard, dappled sunlight should reach the ground at all times as an indicator of good light penetration through the canopy. Canopy training and pruning methods should open the foliage for light exposure. Maintaining canopies to allow maximum light exposure is not difficult but foliage thinning can have the counter-effect of exposing fruit surfaces to excess radiation, thereby increasing skin temperature, accelerating anthocyanin degradation and raising incidence of fruit sunburn. Under hot conditions, over-tree cooling can help lower fruit temperatures and for those cultivars where anthocyanin synthesis declines in the weeks immediately prior to harvest, cooling may reduce anthocyanin degradation leading up to harvest. In South Africa, Wand et al. (2005) found that over-tree evaporative water cooling starting two weeks before harvest usually improved ‘Rosemarie’ (B) fruit blush. However, its effect was relatively small compared to colour change in response to fluctuating temperature in warm production areas. Cultivar ‘Rosemarie’ responds well to lower temperatures but is inhibited under hotter conditions. In comparison, evaporative cooling had no significant effect on cultivar ‘Forelle’ (B) fruit colour or mass but reduced firmness and total soluble solids when started early in the season (Wand et al. 2005). Cooling is less necessary for ‘Forelle’ and ‘Flamingo’ (B) because they tend to retain colour stability under hot conditions, possibly through on-going anthocyanin synthesis (Steyn et al. 2004). In trials in the U.S.A., Dussi et al. (1997) applied evaporative cooling treatments with over-tree sprinkler irrigation to ‘Sensation Red Bartlett’ (FR) pear trees during the final 30 days of fruit development when orchard air temperatures were greater than 29 °C. Fruit from cooled trees were more red and less yellow than fruit from non-cooled trees and in one season, cooled fruit had a greater portion of surface blush. However, fruit firmness between 100 and 150 days after full bloom decreased more rapidly in fruit from cooled trees. Dussi et al. (1997) recommended that cooled fruit should be harvested earlier than non-cooled fruit to maintain postharvest quality. 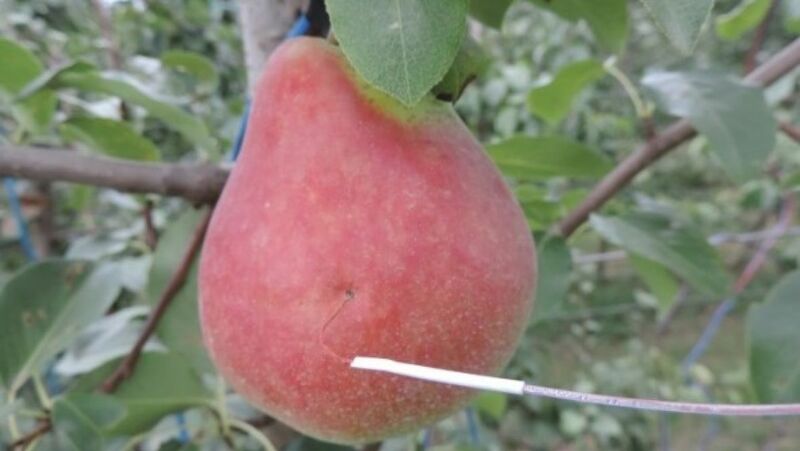 Research in Australia on evaporative cooling has focused on apple and mainly to prevent sunburn damage. Results showed that fruit surface temperature can be reduced by 10 – 15 °C by applying overhead watering during the daytime. Watering can be pulsed and timed to avoid wetting the understorey excessively. In South Africa, Roberts et al. (2008) conducted a trial over two seasons to establish whether red colour could be improved by choice of rootstock. 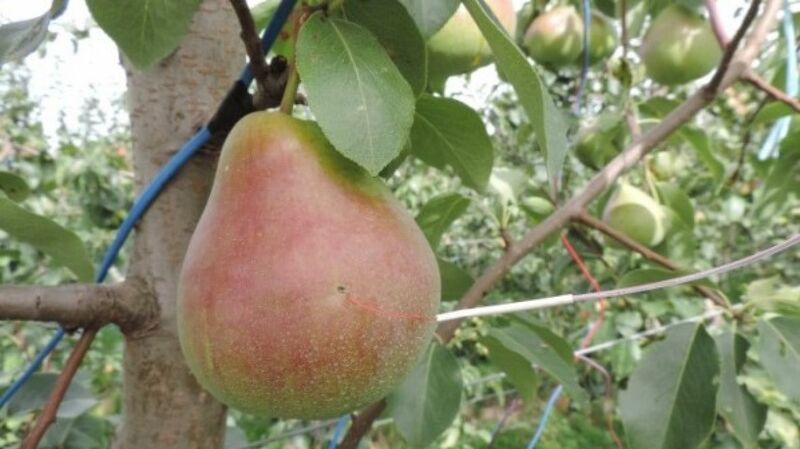 ‘Forelle’ pears were planted on three clonal pear (P. communis) rootstocks (BP1, BP3 and OHxF 97) and three clonal quince (Cydonia oblonga) stocks (QA, QC51 and BA 29). Quince showed better red colour than pear rootstocks even though there were no differences in anthocyanin concentrations attributable to the different rootstock types. Pears grown on quince stocks appeared redder because quince lowered skin chlorophyll (green) and carotenoid (yellow-orange) concentrations. A red blushed pear selection (Ricō®, previously known as Deliza®) from the Australian National Pear Breeding Program (Tatura) that was grown under nets and photographed on 19 January (figure 1) and 23 February (figure 2). Fruit surface temperature was measured using a fine wire thermocouple inserted just below the skin. This particular fruit was well exposed resulting in progressive blush development through the final weeks up to harvest. Reduction of direct solar radiation by netting prevented excessive rises in skin temperature which can cause sunburn. Where a leaf has heavily shaded the top right of this pear, blush has not developed – emphasising the importance of appropriately balanced light levels. 2Horticulture Centre of Excellence, Private Bag 1, Tatura, Victoria 3616, Australia. Dussi MC, Sugar D, Wrolstad RE (1995) Characterizing and quantifying anthocyanins in red pears and the effect of light quality on fruit color. J Amer Soc Hort Sci. 120(5):785-789. Dussi M C, Sugar D, Nina Azarenko A, Righetti TL (1997) Effects of cooling by over-tree sprinkler irrigation on fruit color and firmness in ‘Sensation Red Bartlett’ pear. HortTechnology January-March 1997, 7(1): 55-57. Roberts SC, Steyn WJ, North MS (2008) Effect of rootstock on red colour of bi-coloured ‘Forelle’ pears. Proc. Xth IS on Pear Eds. : A.D. Webster and C.M. Oliveira Acta Hort. 800, ISHS 2008 pages 625-630. Steyn WJ, Holcroft DM, Wand JE, Jacobs G (2004) Anthocyanin degradation in detached pome fruit with reference to preharvest red color loss and pigmentation patterns of blushed and fully red pears. J Amer Soc Hort Sci. 129(1):13-19. Steyn WJ, Wand SJE, Holcroft DM, Jacobs G (2005) Red colour development and loss in pears. Proc. IXth IS on Pear Ed. : K.I. Theron, Acta Hort. 671, ISHS 2005, pages 70-85. Wand SJE, Steyn WJ, Holcroft DM, Mdluli MJ, van den Dool K, Jacobs G (2005) Use of evaporative cooling to improve ‘Rosemarie’ and ‘Forelle’ pear fruit blush colour and quality. Proc. IXth IS on Pear, Ed. : K.I. Theron. Acta Hort. 671, ISHS 2005, pages 103-111.